It has taken a while but finally our Christmas Tree is up and decorated! I love the way it looks and I love to decorate it. My tree decorating approach has always been a bit homemade and vintage style. Lots of our ornaments are made by myself and the girls and every year, when I take them out of the box, it brings back memories of times gone by and traditions stretching back years. First up, the tree in its entirety. We always opt for a real tree, I just love the piney green smell and the glossy look of the tree and although perhaps it's more sustainable to have a 'made' tree, this is one tradition I just can't let go of. Almost all the ornaments have been with us for years - I rarely buy now unless something really catches my eye and my favourites are always the ones made by ourselves, because each one has it's own little story and place in time. This one has been with us for so long that I can't remember its exact origin but I'm pretty certain that it was made in Kindergarten, or was perhaps a Kindergarten gift to Síomha. It's so simple and beautiful. The next few were made by myself and the girls some years ago, not in the least complicated to make but so nice and I remember us all sewing away together. The taller gnome above with the green hat is one of two I bought at a craft fair, isn't he gorgeous? Two things I love to take out every year are my little set of red angels and my African themed nativity set. The angels were bought in an Oxfam fair trade store,which has sadly now closed and the nativity set was bought in a charity shop. I was thrilled to find something so unusual and I usually have this set in the kitchen and our handmade crib in the sitting room (not organised yet so no photos of that). It's hard to capture them well in a photo, but the light glows through them and the jewel colours are stunning and really brighten up the window. This little arrangement just happened organically this year - the metal 'tree' is one I use for display at craft fairs and I ended up just adding a few more things to the shelf, which is also my craft fair shelf for candles. I think it looks pretty cute so may be repeated again next year. Do you have favourite decorations or traditions? I'd love to hear them! Tried commenting earlier via my phone but for some reason it did not post. Anyway, I love your post! Your handmade decorations are lovely and I agree about having a real tree. I can't get myself to have a fake one, they just seem wrong! Nothing like the scent of a real pine tree! This is a lovely post! oh I loved this post. Thanks for sharing your tree and ornaments. It really was lovely to read and a brilliant Christmassy blog post which i totally enjoyed. I love the buttons on the baubles. What a beautiful Christmas tree! I love the homemade decorations and I plan on making some with my boys next year, they always have more meaning than the ones you pick up for a tenner in Asda. I prefer our decorations to tell a story. Your ornaments are adorable! I love real trees so much more than fake trees. Happy Holidays!!! I'm a real tree fan too. I can't believe you waited till this late to put the tree up though! I love the idea of handmade decorations bringing back memories. I thought my 2 year old would be too young this year, but maybe I will give it a try. Thanks for inspiring me. I love your handmade decorations. So nice to have it personal. And loving the lit up 'tree' on your shelf. We don't have many traditions for decorating. Just my fake tree, and that's about it. 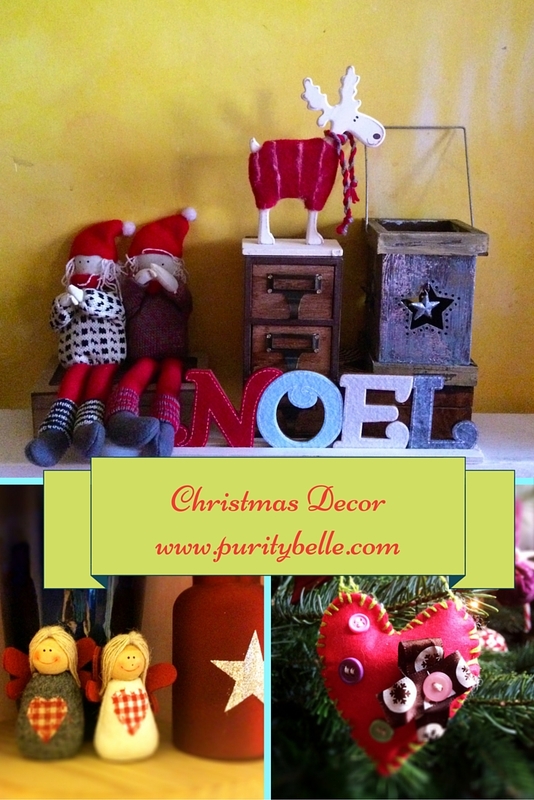 Your handmade decorations are so pretty I think personalized ones add a touch of magic to Christmas! We don't have many decorating traditions but then I have celebrated Christmas in a different household every year. I used to make some ornaments when I was a kid. Now I just really on baubles from shops. Your tree is really lovely. Have a great Christmas. I love looking at Christmas decorations too, I think it's so pretty! Your home is beauitful and so are your decorations. Happy new year!